Yes, I know “simple” is so over-used. . . by recipes where one of the ingredients is puff pastry, or Nutella, or boxed cake mix. But this is the real deal, old-fashioned simple. I promise. If you don’t opt for the toppings, these are the simplest, easiest, no-brainiest bars ever to be. There are literally 3 ingredients, no baking. Only measuring. Measuring just three ingredients. Of course, I couldn’t leave well enough alone and added fancy toppings (freeze-dried raspberries, melted chocolate, and almonds). But those are totally optional. The other amazing thing about these bars is that they’re so versatile. While peanut butter would be delicious, or you can make them with whatever nut butter you have in the pantry, I made them with a blend of nut and seed butter that I discovered this week at the grocery store by chance: NuttZo 7 Nut & Seed Butter. Variety is the spice of life, so this unusual blend of cashews, almonds, hazelnuts, Brazil Nuts, chia seeds, flax seeds and pumpkin seeds stole my heart. NuttZo’s paleo-friendly, non-peanut Power Fuel (a blend of seven nuts and seeds). NuttZo is a “beyond organic” brand because, in addition to being organic, their product is non-GMO, vegan, kosher, certified gluten-free, a B-Corp, and a women-owned business. Nuttzo founder Danielle LiVolsi created the non-profit Project Left Behind, which supports orphanages and neglected children around the world through volunteering, donations, and funding (Danielle herself has two adopted boys, one of which has a severe vitamin deficiency and was the inspiration for NuttZo 7 Nut & Seed Butter). 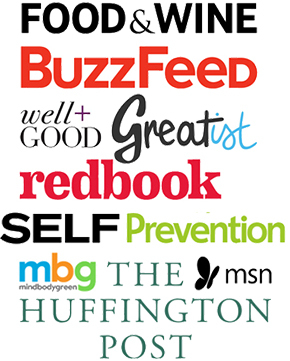 If any of this matters to you, go find NuttZo. The honey that I used to develop this recipe is a hyper-local, eucalyptus-infused, San Francisco version. After licking the spoon, I can report that it does indeed have the faintest flavor of eucalyptus. I purchased mine at Bi-Rite Market on Divisadero Street, I encourage you to look for it if you live in the area or will be visiting San Francisco soon! I support my city of San Francisco’s urban green spaces and capacity for inner-city agricultural production by purchasing hyper-local honey. Press the dough into a muffin pan (I used silicone for maximum ease in getting the cups out after freezing) and let them have a 30-minute stint in the freezer. Then. . . done! Simple, basic, yet delicious. Thennnnn (if you’re like me) you doll the cups up with melted chocolate, almonds, and freeze-dried fruit. What can I say? I love a delicate, brightly-colored dusting of freeze-dried raspberries, a glossy drizzle of chocolate (I used unsweetened, 100% cacao) and a single almond as a focal point on each cup. Combine the coconut, nut butter and honey, mix well. The mixture will be sticky and have the consistency of coarse sand. Press into a muffin pan (I used a silicone muffin pan, which makes the cups easy to remove). Place in the freezer for 30 minutes until hardened. Optional: decorate with nuts, freeze-dried raspberries, melted chocolate, or other toppings of your choice. Best if stored in the refrigerator, or the bars will soften. Oh wow! I love the ingredients in that nut/seed butter! It is so nice to have variety for gut health! Thank you for the brand lead! I know, isn’t Nuttzo fun? Variety is the spice of life! So yummy! 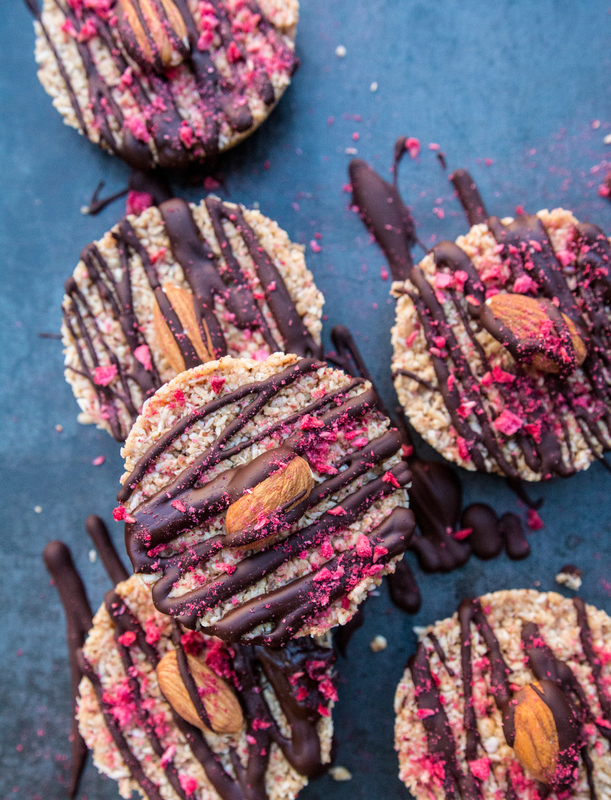 These are so pretty with the chocolate drizzle and freeze dried raspberries on top. Such a fun treat! I saw these yesterday and promptly made them for my son’s after school snack. We LOOOVED them. It kind of reminded me of honey nut cereal, but so much better. I also love how easy they were to make! This will definitely be something we make quite often. Thanks so much for the recipe! You made them already?! So glad you enjoyed them, and that I’m not the only one that’s totally head over heels for this recipe! What!?!? How have I not heard of Nuttzo! That blend sounds amazing! Yum! I know, seven nuts and seeds? Sign me up! Love that these look so delicious and only consists of 3 ingredients! 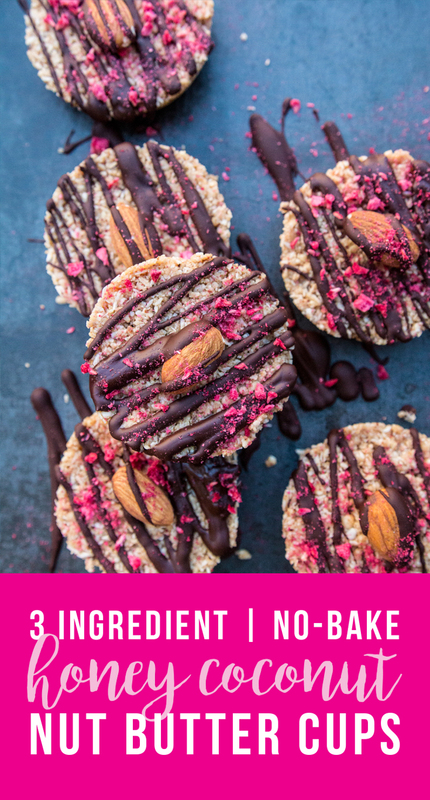 No bake & 3 ingredients, sounds perfect! How can you not love the name Nuttzo. what a great nut and seed butter! Oh my gosh I would go ham on these… Need to make them soon! Healthy products with a mission that benefits society are where I like to spend my money! I love everything no bake and this 3 ingredient coconut nu butter cups look and sound simply amazing !! These cookies look so delicious and I love that they’re no bake! The freeze dried raspberries on top are the prettiest! I haven’t tried this brand yet but now I can’t wait to run out and grab some! These are just gorgeous with that chocolate drizzle and raspberry powder, and that nut butter sounds so amazing! I will have to try it. Thank you! Sometimes cannot resist the gorgeousness that is freeze-dried raspberry. These look amazing. And only 3 ingredients. That’s my kind of cookie! These look incredible and I love how simple they are! I just started using freeze dried strawberries too, and I love the color/flavor they add to desserts! These look absolutely amazing! I must try these soon. Wow! This real food creation looks amazing!